Do you want a 18x18 red and white stripe outdoor pillows that had excellent water resistant UV resistance and anti-fading for more than 500 hours? Fabritones USA LLC, A Georgia Company, brings you the Top-Rated outdoor decorative pillows. You will love this patio cushions that each one is with a puffy pillow insert. Great gift idea for Moms and Dads, Valentine's - Mother's - Father's Day - Thanksgiving and Christmas. - The patio accent pillow works in both indoor and outdoor space. It will add a pop of color to your furniture ensemble. - These outdoor throw pillows are square, 18 inches, mildew resistant and offer UV protection to resist fading. Infused with a trendy pattern this patio cushions will be a charming and functional extension to your couch bed sofa or patio. - Fabritones USA LLC from Georgia, is a different kind of company that prides itself in providing the absolute best customer service in the industry. If for any reason you are not satisfied, send a simple email and receive a 100% money-back refund, absolutely no questions asked! - With purchasing our Fabritones outdoor pillows, you become a part of our family and you are automatically enrolled in our 100% satisfaction guarantee program. Our #1 goal is to find you top quality deals, at great discounted low prices, and to provide you with the ultimate best customer service in the world. Shop happy & confident with our 100% money-back guarantee, you deserve it! 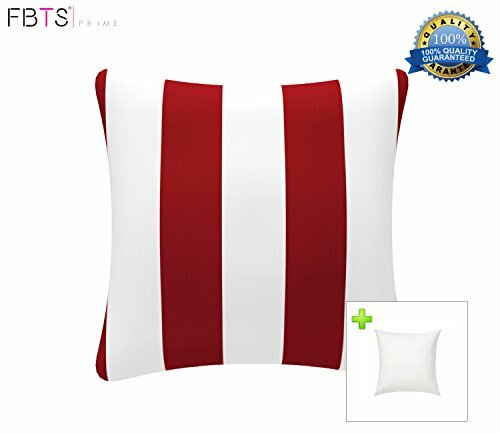 ★VALUE BUNDLE - Includes 1 red and white stripe outdoor decorative pillow cover 18x18 inches + 1 pillow insert. Suitable for indoor and outdoor use. Our outdoor throw pillows has a bright color and makes your garden dress even more beautiful. ★UV AND WATER RESISTANT - Carefully treated for outdoor use. Square 18 inches patio accent pillows is mold and mildew resistant and feature UV protection to resist fading, resists weather and fading in sunlight more than 500 hours. All products have passed the AATCC 16.E test standard. ★EXTRA COMFORT AND LONGEVITY - In order to make the pillow corner plump and fluffy, they were produced under a special processing. Even with the protective coating, the patio pillow covers still feel nice and soft to make for incredibly cozy lounging out on the patio or indoors. ★EASY CARE - Through use the zipper, the pillow covers can be quickly and easily removed for cleaning purposes when needed. Spot clean only, it must be thoroughly dry before placing on furniture or floor. Do not bleach. If you want to change the pillow insert, check our high quality pillow insert, Asin: B01FQ5K60C which is perfect match for the pillow cover. If you have any questions about this product by FBTS Prime, contact us by completing and submitting the form below. If you are looking for a specif part number, please include it with your message.